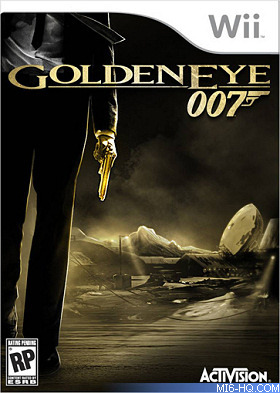 First spotted by Superannuation earlier today, Activision have registered several domain names for a possible new GoldenEye game: goldeneyereloadedgame.com, goldeneye007gamereloaded.com, goldeneyereloaded007.com, and goldeneye007reloaded.com. All of the above domains were registered by Activision on Friday 24th June, 2011. Last year's 're-imagining' of "GoldenEye 007" (2010) exclusively for the Nintendo Wii could be coming to other platforms such as PS3 or XBox 360. The title sold well on the Wii and easily outstripped its rival 007 title "Blood Stone", although the market for shooters is far more crowded and competitive on the other consoles. Could the Wii title become un-exclusive? The long-rumored but ultimately moth-balled (for licensing reasons) high-definition refresh of the original 1997 "GoldenEye 007" game for N64 may be hitting the XBox Live Arcade and PlayStation Store soon. Microsoft completed work on the project for a '10th Anniversary' edition but its release was deep-sixed by Nintendo executives back in 2008. Could the politics at Nintendo have changed enough to allow the original game's release on rival platforms? Above: The first leak of the 're-imagined' Nintendo Wii title released last year used this box artwork mock-up. Nintendo unveiled the first sneak peak at their next console, the Nintendo Wii U, at the E3 expo in Los Angeles earlier this month. The new console will boast HD graphics (on a par with the PS3 and XBox 360) and an innovative tablet controller. Although all existing Wii games will be compatible, they won't automatically take advantage of the 'U's improved hardware. Could a polished-for-HD "GoldenEye 007" be a launch title for the console next year? Could the original "GoldenEye 007" (1997) be joining the many Nintendo 64 games that are being ported to the new 3DS handheld system? Although this is one of the quickest options, it has the issue of having Pierce Brosnan in the leading role - something the 2010 Wii game had to update to include Daniel Craig. Fans have for years bemoaned the movie industry for re-releasing the same films repeatedly on DVD as 'special' and 'ultimate' editions, tempting them to buy the same title more than once. Coined as a double-dip, could "GoldenEye 007" be one of the first major videogame titles to adopt the practice, perhaps with additional missions, extra multiplayer maps and characters and other special features? 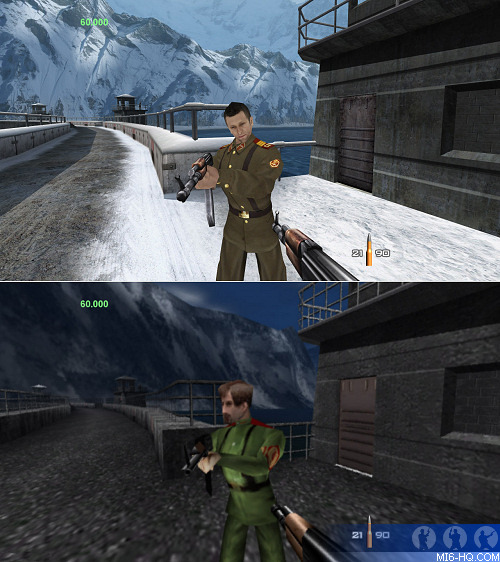 Above: A screenshot of the completed XBox 360 '10th anniversary' edition (upper) which was never released, and the game running in Nintendo 64 mode (lower) for comparison. Activision have confirmed at least one new James Bond videogame for late 2011, although this is believed to be an original third-person adventure starring Daniel Craig developed by Raven Software.